Easter sunday 20th of april 2014 at Paradiso. FPQXL DJ TEAM: YUKI, HEY GIRL HEY, BIG SURPRISE! OPEN 23.30 HRS TILL VERY LATE! ULTRASEXI is a Dutch, Amsterdam based, cooperative, creative and production platform for—and with—young talent. It was founded in 2008 with the aim to match, encourage, inspire and support young creative people. Throughout it’s existence a significant network growth has taken place in all creative fields connected. We use parties and nightlife as a medium to shed light upon our aims of living a more creative and free spirited society. On August 5th 2005 during Gaypride, we started M.U.L.T.S.E.X.I. in Studio80 in Amsterdam. In 2006 we began F*cking Pop Queers (FPQ) every Wednesday night, at Studio 80. Since 2009 till 2013 FPQ was celebrated every second saturday of the month at Jimmy Woo, Amsterdam. In 2008 M.U.L.T.I.S.E.X.I. celebrated it’s third birthday under the name of ULTRASEXI at Paradiso, Amsterdam, which was a huge success. It was the start of a new tradition. Every year on Gaypride-saturday we celebrated our queer existence at ULTRASEXI in Paradiso, Amsterdam. This same event was the basis for the then freshly developed platform called UltraSexi (U*S). In 2008 Ultraviolet initiated in Flexbar, Amsterdam, a party evolving around Art, Music, Light & Fashion. In 2011 we substituted UltraSexi by FPQ-XL at Paradiso. 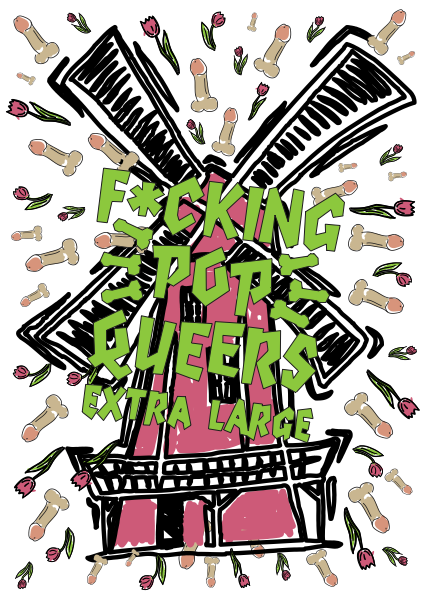 In 2013 we started hosting our own F*cking Pop Queer area at the Milkshake festival. Also that year we hosted a one-off FPQ stage at Valtifest. September 2013 we started a new night at the Sugarfactory: XENOMANIAX, after a short intens four months XENOMANIAX left the Sugarfactory in search of a new home.